A couple of weeks ago while playing with the dishes I came up with this tablescape. 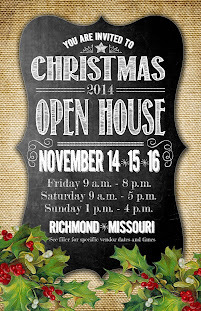 Originally it was to be used Christmas Eve, it didn't make the riffle. I ended up choosing the Royal Stafford. I thought it worked better with the Santa has the centerpiece. So, I put together this tablescape as a backup, I thought I would have my act together and get it posted before Christmas. Guess what, that didn't happen, lol. 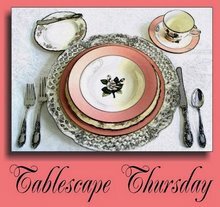 I hope you enjoy viewing it this week, the last week of tablescapes for the year 2010. I don't normally decorate with blues for the holidays so had to rush out and find some blue ornaments to work into the arrangement. Do any of you do that? Change your mind midstream and have to rush to finish a project? The ice and berry picks I had in my "large" supply of goodies downstairs, so I started playing with the arrangement until I came up with what I think works for the table. If you look closely I popped in a couple of natural branches from the yard. Adding the crystal reindeer provided a bit more bling. I've been wanting to use this Haviland china for a long time. Originally purchased a piece or two at a time from the local grocery store. Over the course of the last few years I've sold many sets in garage sales, this set has made it out there many times only to be pulled back inside. lol I've decided to hang onto it. It's the first full set of china I have. Except for one small detail. In one of the many moves we've made over the course of the last 32 years a cup got broken. I had forgotten about it until preparing for this tablescape. I tried to order one through ebay, thought it was on it's way only to be disappointed to find out the gal did not have it in stock. So, today I'll get back to my research and try to locate another cup to complete the set once again. I don't recall where I got the flatware, it has a nice balanced weight to it along with some great details. I just discovered the reflection in the spoon, don't you love those kind of surprises? I love anything monogrammed, so when I spotted these last year at TJ Maxx I picked them up in silver and gold. Here you'll find a close up of the centerpiece. I just realized while working on this post, there is no champagne, or candles. When we were kids in school we would ask for a do-over. Guess I can have a do-over in the future, with the same china, different centerpiece and a bit more bling here and there on the table. :-)) Sugar anyone? The sugar scuttle is a cherished gift from a friend for my birthday a few years back. A little side note: 32 years ago today I married the love of my life. We've shared many things over the course of these years. There's been alot of laughter and joyous times. As we start our 33rd year of marriage we'll take those memories with us and create new ones. Remember to always cherish the moments you have, enjoy the laugher, we know not what tomorrow brings. From our home to yours we wish you a Safe and Joyous Happy New Year! Until next time..
Hi Lynne! Oh, your centerpiece is gorgeous! You're so good at arranging!! Now I love your Haviland - Blue Garland china as I have some too! My mother gifted me with her set a few years ago for Christmas! I just think it's so pretty. Greetings from Southern California. I hope you have a great New Year! Your table is beautiful. I love the blue mixed in your centerpiece. Happy Anniversay my sweet friend. We must take one day at a time! and enjoy each minute. Love Love your centerpiece today. Make me smile on this dark and cold day!!! How I love your table setting. My mother-in-law had the same set of china. I remember that she purchased it piece by piece from her local Acme grocery store. I think it is beautiful. The set went to my brother-in law and I have not seen it in years. Thank you Pat, you are so right one day at a time. Like you the day is dark and cold, perfect for staying in. Happy New Year! I love this table! This would be great for New Year's Eve, too! Beautiful tablescape, Lynne! I love your centerpiece! And I have a set of the Haviland from a thrift shop and I love it! I love your centerpiece! Everything goes together so well, right down to the reindeer! Beautifully done! Happy Anniversary! I have a similar sugar scuttle given to me by a dear friend as well. I love it, it is one of my favorite pieces. Happy Anniversary -- we just celebrated 35 years. I love your pretty table -- I noticed a lot of blue in Christmas decorating this year and pointed that out to my husband. Love your pretty china (I have it too!) Happy almost New Year! Your centerpiece is outstanding.. and yes last night I ran out for some napkins i saw for the last christmas tablescape, to post next year! What's a gal to do when she has the right flowers? I love your Haviland. It's so delicate and pretty. If you like monogrammed napkins, visit me and have a chance to win some of your choosing.. Happy New Year to you and yours, may the new year bring lots of blessings! Very pretty - really like the cobalt blue plates. YOur centerpiece is a masterpiece. The blue is lovely for Christmas! I love the way you set an ornament to top off your place setting. Lynne, this is a lovely table! Those dishes are so graceful and beautiful. Sometimes the older patterns are just so much more special than the newer ones. I'd love to have a set of them. I'm a sucker for dishes with blue flowers. That's what I chose for my "good dishes" when I got married 41 1/2 years ago! 'Happy anniversary to you and your sweetie. Oh Wow! That is the most amazing centerpiece! I think the blue really makes it stand out. Very pretty. Loved all your table. Just gorgeous. Hope you and yours have a Healthy and Happy New Year. Happy Anniversary too. So pretty - I especially love your glamorous teapot! I would feel so special at your table. I love how you pulled the centerpiece together. Beautiful! I love the centerpiece with the blues, and yes I've run out to find something at the last minute after changing my mind midstream! lol That's so funny! 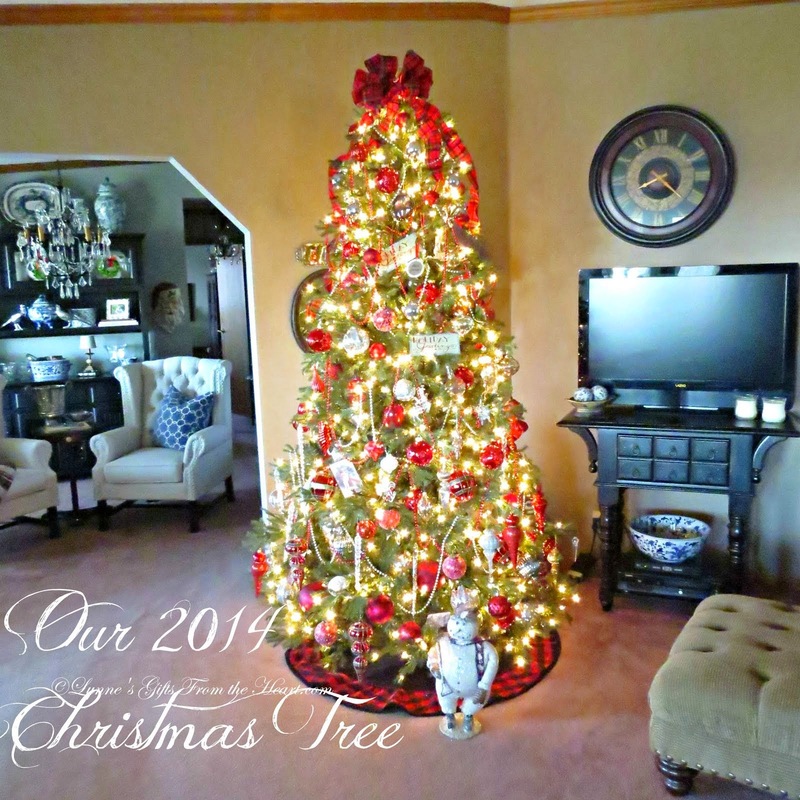 I have those same ornaments in brown...they're great! I just got some more on clearance yesterday, in red. I keep thinking I should pick some up of each color. They were a good price to begin with and now they're 75% off...in case you want to go grab some more too!